There are few projects out there that can raise the appeal and value of your home quite like the construction of a brand new outdoor deck space, and as it so happens, the summer is one of the best times of year to have this kind of project done. Beautiful outdoor deck spaces are highly sought after by homeowners all over the country for a number of different reasons, and if you have ever considered having a new deck space constructed for your home, now might be the time to take that step and do so. 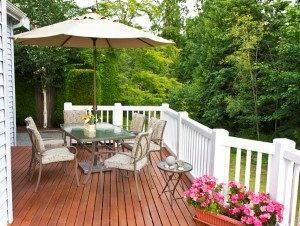 If you are still on the fence about whether or not installing a new deck area is the right investment for your home, we invite you to read through this short article our team of professionals have taken the time to put together that highlights just a few of the many reasons that you might want to do so this summer. The construction of a new outdoor deck space for your home is a surefire way to enhance the overall visual appeal of your property. When designed and installed correctly, a new deck can give family, friends, and any other guests who visit your home a positive impression as it helps to make your home more inviting and visitor friendly. The design of your new deck plays a major role in its appeal, so make sure you have a professional on hand to help you design carefully. Another great reason to install a brand new outdoor deck space for your home is that it gives you a perfect space for entertaining. Whether you enjoy have family and friends over on a regular basis, or you only tend to host a few larger gatherings every year, your new outdoor deck space will provide you with a comfortable place for everyone to gather together and enjoy everything your home’s outdoor areas have to offer. Even if you aren’t into entertaining large gatherings, a new outdoor deck space can provide you and your family with a quiet retreat to relax together and enjoy each others’ company at the end of a long day. As a responsible homeowner, you want to do everything in your power to keep your home’s value high, and installing a new deck is a very effective way to do so. One of the best things about installing a new outdoor deck space to your home is the return on your investment that you get from it. In fact, when designed and constructed properly, you can expect to gain as much as 80 – 85% of the cost of your new deck as additional value for your home, making it a great long-term investment for your home. If you are looking for a professional pole barn building company in the Adrian area, give us a call today at 517-486-3784 or fill out our online request form.